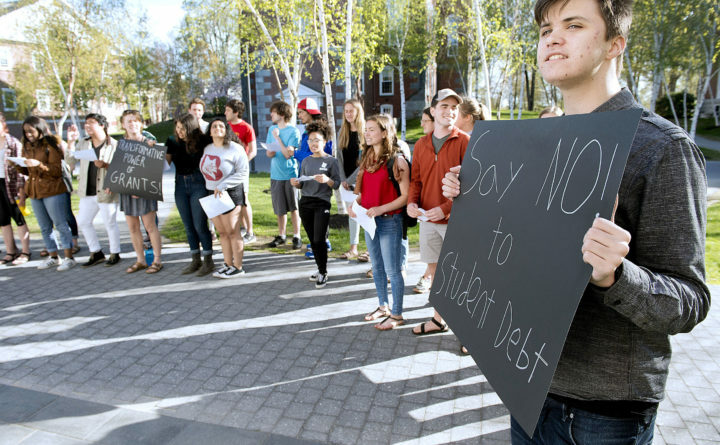 Bates College freshman William Hibbitts speaks out against student debt and for tuition grants during a Bates Affordable Education Campaign rally on the campus in Lewiston, Maine, Friday, May 11, 2018. Student loan debt in Maine rose 94 percent from $3.1 billion in 2008 to $6 billion in 2018, according to a study by credit agency Experian. Nationally, the total debt is at an all-time high of $1.36 trillion, up 129 percent since 2008. South Carolina saw the largest rise of 315 percent to $23.1 billion over the 10 years. Student loan debt is the second highest credit debt behind mortgage loans. The 43.2 million Americans with student loans on average carry $22,600 per person in student loan debt. That’s up 20 percent since 2015. The average monthly payment is $357. There’s some good news in all those numbers. Most borrowers are keeping up with their monthly payments, with only about 6 percent falling behind. That’s almost 4 percent fewer delinquencies over the past three years. Experian said those struggling to pay loans have several options. Those with federal government loans may be able to adjust their repayment based on what they can afford. They also may be able to consolidate their debt. Private banks may offer other options, according to Experian. CourseStorm, an Orono company with an online class registration and enrollment management service, on Thursday completed a $1.15 million round of venture capital financing. CEI Ventures of Brunswick, Maine Venture Fund of Newport and LearnLaunch of Boston invested in the company. CourseStorm said it will use the investment to grow and make learning accessible to more people. CourseStorm is used by small- and medium-sized local educational programs to register students and process payments for classes ranging from community education to health and wellness classes to workforce development, after-school programs and corporate training. The company has clients in 44 states, including a small township in Maine to the Museum of Modern Art in New York. To date, the company has registered more than 225,000 students for classes. CourseStorm recently received the Bangor Region Chamber of Commerce Entrepreneurship Award. It plans to create 20 new positions over the next 36 months. HospitalityMaine, an industry association, said Wednesday that it hired former state treasurer Terry Hayes as director of workforce development. Hayes also was a 2018 gubernatorial contender. She will direct the nonprofit group’s new hospitality apprenticeship program and lead education and training programs for HospitalityMaine’s 1,000 hotel and restaurant members. Behind health care, hospitality is Maine’s top industry. There are 4,000 vacant jobs in hospitality, according to the association. Hayes got her start in the workforce as a waitress in Lewiston and a chambermaid in Kennebunkport. Tariffs on Chinese imports, along with those on imported steel and aluminum, are making it more expensive to make food service equipment, according to a survey by the North American Association of Food Equipment Manufacturers, a trade group based in Chicago. More than 80 percent of respondents said tariffs have hurt their businesses. Some 50 percent said tariffs on Chinese imports are affecting their ability to compete and 53 percent said the tariffs were hurting sales. Some 56 percent said tariffs on imported steel and aluminum have impaired their ability to compete and 47 percent said the tariffs are hurting sales. The majority of respondents also said the Chinese, steel and aluminum tariffs are raising material costs from 6 percent to 15 percent. “The survey clearly demonstrates that tariffs are negatively impacting U.S. businesses, which doesn’t bode well for U.S. jobs and a strong economy,” association President Joe Carlson said. The association said food service equipment is a $13.5 billion U.S. industry. About 60 percent of the association’s members are small- to medium-sized businesses throughout the country. While there aren’t any commercial food service equipment manufacturers based in Maine, the impact of the tariffs will be felt downstream through the dealer, service and operator community, said Charlie Souhrada, the association’s vice president of regulatory and technical affairs.